I had a rummage through my stash looking for long lost projects to make as part of my stashbust. 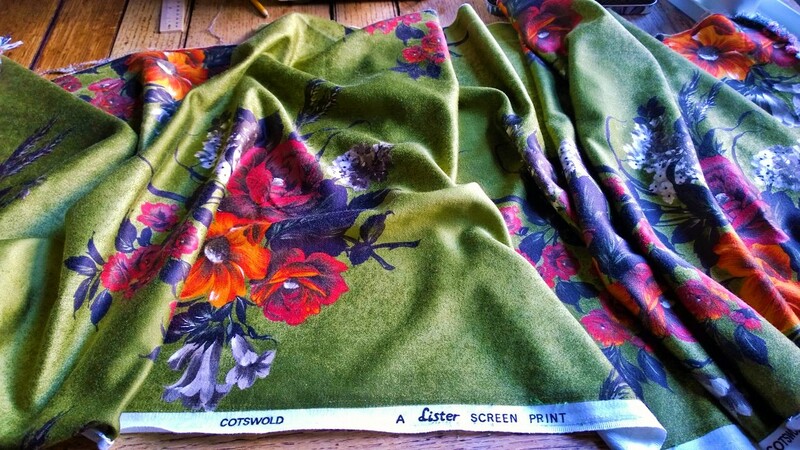 I came upon this piece of vintage curtain fabric, bought from the local flea market last year, I think it cost £8. 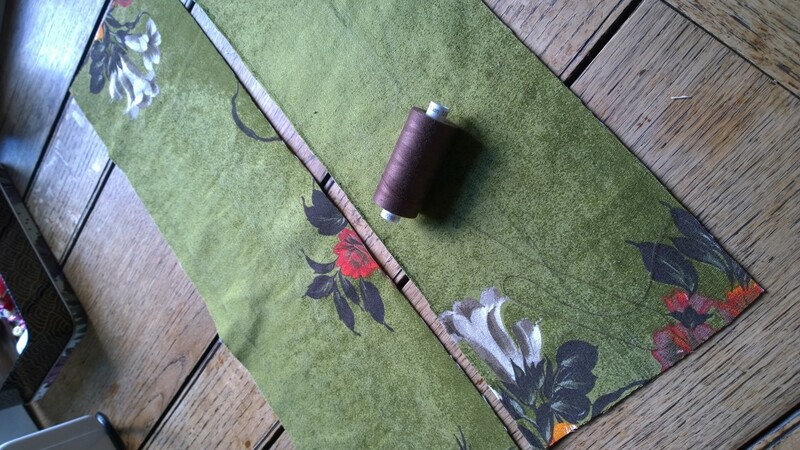 It is getting so difficult to find vintage fabric nowadays so I snapped it up with a view to making a rather lovely vintage skirt. That was as far as it got before languishing at the bottom off my stash chest, until now! It is quite a heavy fabric so did take up a fair bit of space in the pile so I thought I’d create a bit more room by finally putting it to use. 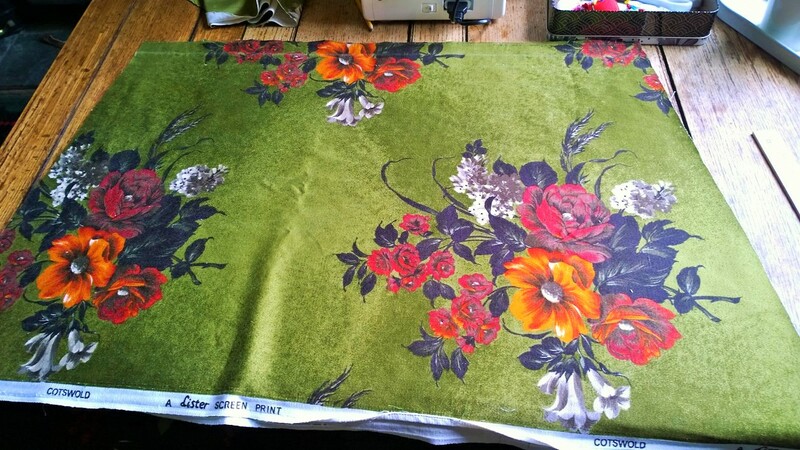 The problem with this fabric was that although it was two and a half metres long it was only 57cm wide. I knew I wanted a skirt with a bit of body and flare but it was too thick to make a gathered skirt. I raided my skirt patterns but couldn’t find any which could be cut with my limited fabric and so I decided to have a go at drafting my own. I knew I wanted it fitted over my tum and hips and so I thought I’d go with stitched down pleats or tucks. I cut two pieces for the waistband along the crossgrain as I couldn’t spare anything off the length. I planned to stitch the waistbands together at the sideseam, fold it double and attach a side zipper which would go all the way to the top of the waistband. After cutting the waistband I cut the remaining fabric into two equal pieces. I tapered the sides a bit to add some shape and reduce the bulk around the top of the skirt. Then it came to figuring out where to place the pleats. Half the waistband measured 16 inches. I roughly calculated that I could fit six pleats in total at a depth of one inch each. I decided to put three pleats either side and so spent quite a while measuring, fiddling, pinning, unpinning and fiddling a bit more until the pleats were more or less even and the waistline was matching the waistband at 16 inches. 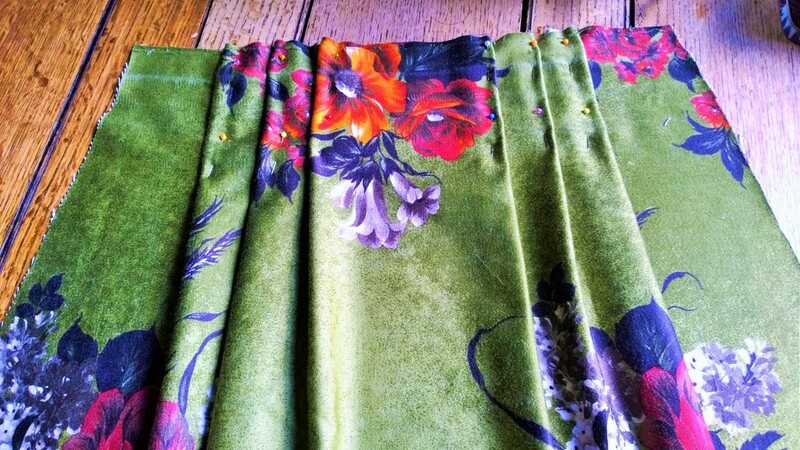 I did exactly the same for the back piece and then stitched the pleats in place on the inside. They are actually more like tucks as I stitched them as you would do a tuck. I did two rows of stitching and backstitched a few times at the bottom as I didn’t want them to come undone, this has unfortunately happened with the stitching on the pleats of my Colette Zinnia, I guess they just couldn’t take the strain! It was easy to put together after that, I sewed the side seams (no pockets because I didn’t have enough fabric and thought they might gape a bit with the fitted top of the skirt) and then attached the waistband, interfacing both sides. I put a standard zipper in the side seam and took it to the top of the waistband so not need for a button. 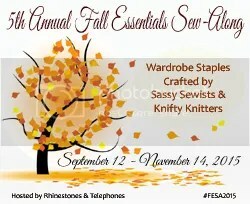 I turned the hem up using the selvage and was finished! I’m quite pleased with the result, although when I asked my other half what he thought his reply was that it looked like an old curtain! I countered this by informing him that it was vintage and if Julie Andrews could do it in the sound of music then so could I! (Hence the Maria Drape Skirt! It is quite a heavy skirt so I think it will probably work better in the winter with thick black tights and a sweater. It was only after taking these photos that I realised that the skirt is quite well camouflaged with the flowers and greenery in the background! I think this skirt was a bit of a nostalgia trip for me, taking me back to my teenage years when I wore nothing but ‘vintage’ which was then called second hand. In abundance, dirt cheap and therefore affordable to a fifteen year old indie chick! We had a wonderful shop called Jins which was full of clothes from the twenties onwards. I was quite lucky being short and a bit curvy as clothes from the fifties fitted me perfectly. Most of these clothes have got lost along the way but I still have a couple of dresses and a beautiful New Look style shawl collared coat which I will probably never be able to fit in again but can’t bear to get rid of. I just like getting them out and admiring them every now and a again. A bit like all the shoes I have which I can’t walk in but occasionally put on to do the ironing in! I guess I am a bit sentimental about clothes, I’ve still got the top I was wearing the night I got together with my other half! I just think clothes hold memories, sometimes more tangibly than photographs. Do you have any sentimentality when it comes to clothes? Have you any treasured outfits which hold memories for you? 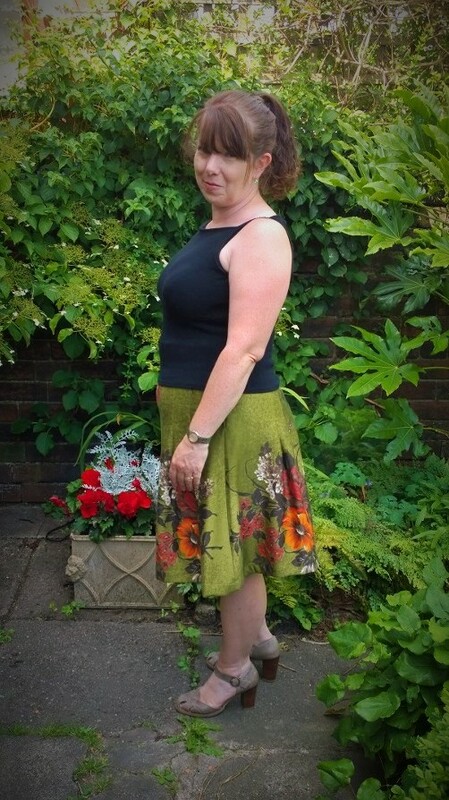 This entry was posted in Finished Sewing Projects and tagged summer stashbust 2014, vintage fabric, vintage skirt. Bookmark the permalink. Wow! I am so impressed! You drafted a beautiful skirt and sewed it so perfectly! I too can be sentimental about clothing. I have loads of clothes that no longer fit me but I keep them because of the memories hey hold. 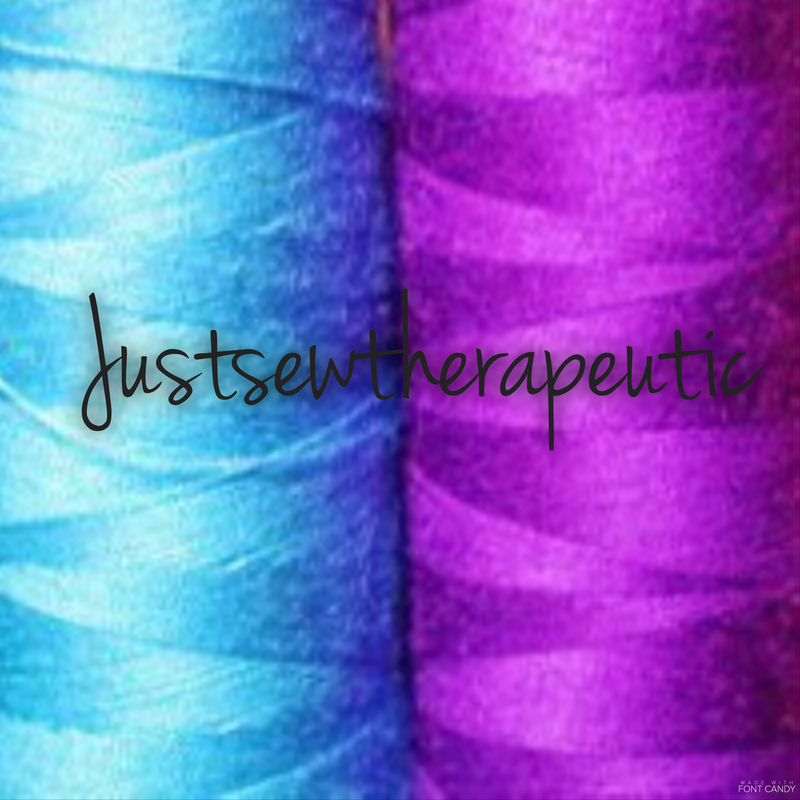 I love your blog and I’m so glad I’ve found it. Have a great weekend! Your skirt looks amazing, Helen. I don’t think it looks like an old curtain at all! This skirt is gorgeous, I can totally see it with tights in the winter! Glad I found your blog! I love your makes! I love this skirt – will be amazing in the winter with thick tights. I have moved so many times that I dont have a lot of very old clothes! When I met my husband I was wearing a skirt that I made myself which he absolutely hated – it was kind of pink and draped and not altogether successful. Luckily I bought him a pint so he decided to overlook it! The thought of moving fills me with dread as it would mean clearing out the loft! I’ve got so many clothes and shoes in there including most of my sons baby clothes! He seems to have inherited my attachment to things too, he won’t let me get rid of any of his books, they all seem to be his favourite ones from when he was a baby! 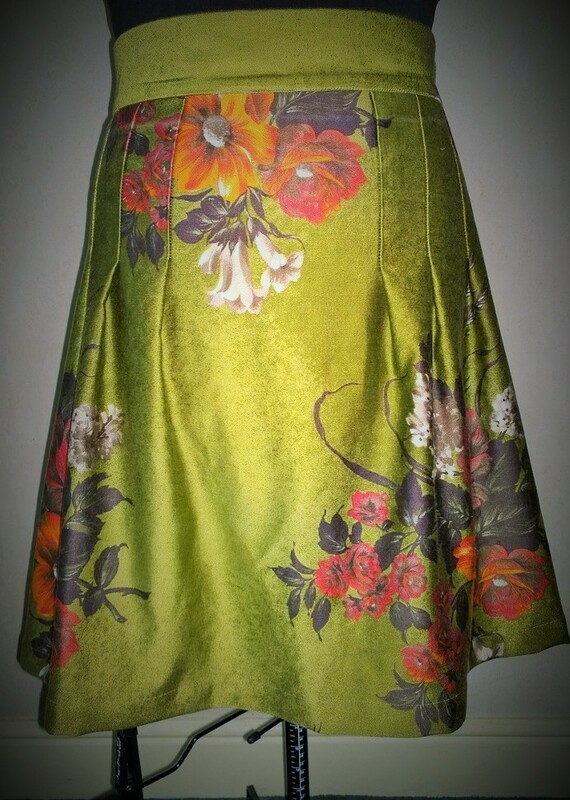 Gorgeous skirt and love the way you drafted it to suit the fabric. Thanks, glad I managed to make it fit with it only being 57cm wide! Was a bit panicky when I couldn’t find a pattern that fitted but it worked out in the end! 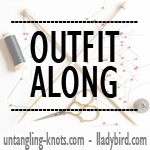 Wow – so impressed with your sewing improve skills! Doesn’t look like a curtain – I think the fabric is beautiful. I am also extremely sentimental with clothing – I’ve been know to cry when getting rid of stuff that doesn’t fit because of the memories associated. Some of them I just can’t get rid of at all (even if there is no way I could wear it). 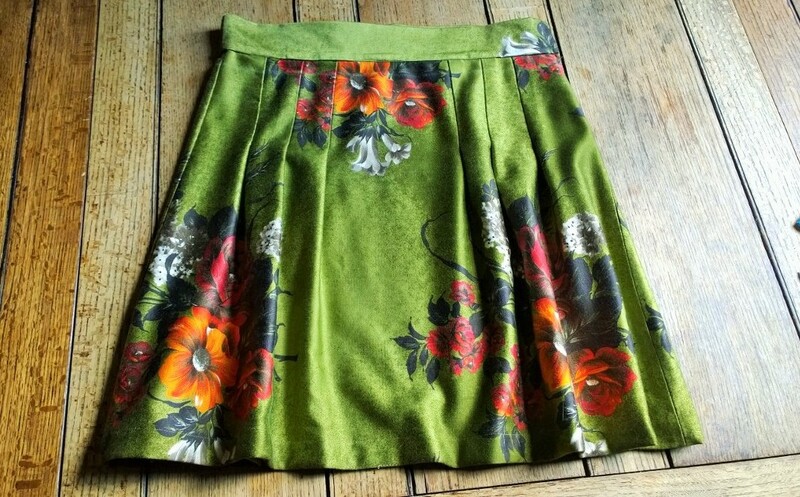 Anyways, great skirt – would look great with some tights in the winter time. Thanks! I keep hanging onto things hoping that one day I may fit into them again! Think the time has come to be ruthless though as I really need the wardrobe space!